One block away from where I took this shot is a sculpture garden and gallery designed by Isamu Noguchi. It helped to establish an arts community in Long Island City, Queens right in the middle of a neighborhood filled with warehouses and factories. You can’t help but feel very calm inside the garden even though there is constant noise from trucks and construction nearby. 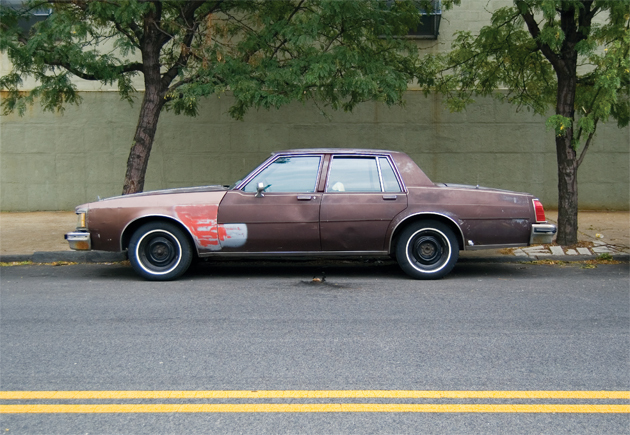 I passed by this Oldsmobile Delta 88 several times waiting for the other cars to move away. I didn’t want to leave the area without capturing this one. I love the circles of the whitewall tires and the straight double traffic lines. The origin of those double lines comes from a Yorkshire farmer in the 1800’s named George Barber. He used the lines to designate the route and boundaries of his farm as well as to identify his sheep. However, in New York City it designates a no passing zone with the exception being emergency maneuvers or during road work. Regardless of barriers and boundaries I hope that you don’t let anything get in your way of seeing the Noguchi Museum. It is a wonderful place that deserves as much patronage as those other NYC icons like the Statue of Liberty, the Empire State Building and the Times Square Olive Garden.